In this section we will consider different traditional methods of composting but first as a object leason I include a photo of the type of traditional "open air heap" that may still be found in some gardens and that has done much in the past to put people off composting. This photo was taken in the garden of a cottage in the Lake District in the spring of 2014. All the waste material from the garden has been dumped against the wall at the bottom of the garden to rot. New grass mowings can be seen near the front of the heap. Older grass cuttings are rotting as a wet smelly mat. There is no evidence of any attempt to harvest composted material. In the past no garden was without its compost heap and while dumping the waste in a corner of the garden could hardly be considered a “method”, as it solely depending on the fact that "Compost Just Happens", it would all breakdown eventually. It might be argued that this is the “traditional method” of composting. Those as ancient as myself can remember gardens with vaste plies of compost lurking, in slightly threatening, heaps that take on a life of their own while the composting just happens. Tradition had it that the bigger the heap the bette the composting as the material would heat up and retain the heat better speeding up the decomposition and killing weeds and disease causing organisms. This is true but the mix and the conditions need to right to make the compost heap and asset rather than a threat. 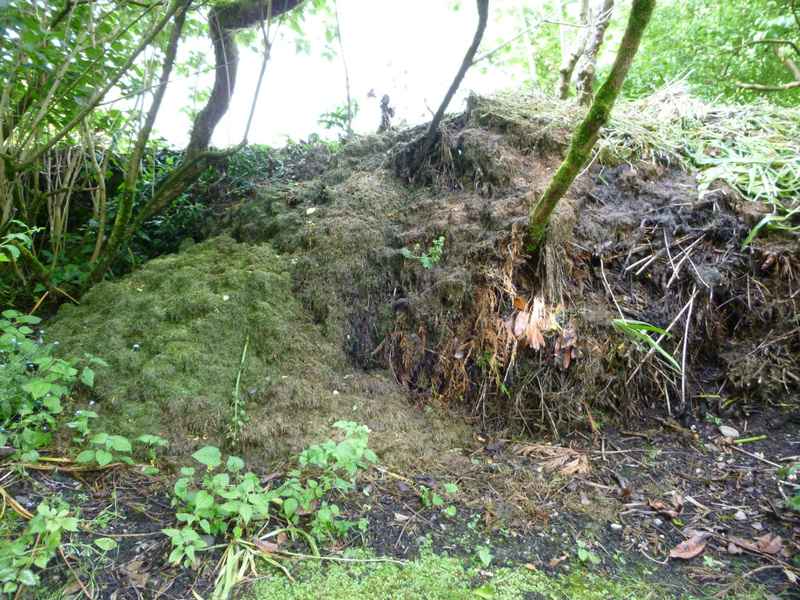 In the days where gardens consisted of a large lawn the grass mowings, having a high nitrogen, content rotted formed a wet, black evil smelling slime that would ouse out of the heap. This will still happen when composting grass in a modern bin, but on a smaller scale. unless the grass is mixed with carbon rich garden material, such as straw, hay, wood shavings or litter from the chicken shed. . Today we would also add cardboard and shredded paper as a source of carbon. It was a brave gardener who attacked, or attempted to harvest, the beast of a compost heap and many an amateur garden must have dreamt of moving house rather than risking life and limb in an assault on the monster. The pile could be tamed slightly by retaining the composting material within a cage made of wood, corrugate tin (in the past asbestos sheet was popular! ), wire netting or even old tyres. Containing the compost in such bins had the advantage of making it easier to turn the material, so as to provide aeration and reinvigorate the composting process. To retain moisture during the summer and to prevent soaking during rain it was often covered by carpet. I have chosen to regard Sir Albert Howards Indore method of composting as the traditional one but have include some others to provide variations on the theme. The compost heap is built on a base of brush or other course material about a foot high and wide in what will be the centre of the heap. A 6” layer of green garden waste such as weeds, grass lawn clippings, uncooked kitchen waste, animal manure, wood ash, cardboard etc. is placed over the brush core. In the past and non-household situations dried blood, fish meal, waste from brewers etc have been composted using this method. This layer is covered by a 2” layer of cow manure (or 1” of chicken manure) onto which a layer of topsoil and a sprinkling of pulverised limestone was added. Further layers of “greens”, manure and soil/limestone are added until the compost heap reaches a height of about five foot. The compost was turned to after 6 weeks and again after a further 6 weeks (12 weeks). This aerated the contents and encouraged microbial activity. The advantage of having two or three bays to the composting area is obvious in the material can be turned from the first to the second bin with the third being used to allow the compost to mature. The uses of shredded material has the advantage of providing a larger surface area, helping to retain moisture, is better insulated and more easily aerate and as such assists microbial activity. The temperature within a heap made of shredded material can easily reach 140F within 24 hours. The height of the heap will shrink as the material decomposes possibly being reduced to 3-4 feet in the first week. The heap will cool within about 2 weeks and the compost can be left to mature. The heating of the heap is important to the hot method of composting as it is this that kills the weeds, seeds and pathogens. In order that the heap heats up to a suitable temperature it should be at least a metre square (Rodale in the Complete Book of Composting recommends 4-5 feet square and 5 feet high). The moisture level of the compost is important and it is recommended that the heap is protected from drying out and becoming soaked by the rain. Originally earth, hay or old sacking was recommended but in many cases this has been replaced by old carpet which has now been superseded by polythene. The traditional compost heap described in this section is based on the recommendations of W E Shewell-Cooper ( Compost Gardening 1974 David & Charles) using 3 wooden bins built using planks with a 1” space between them to allow air to enter the heaps. Shewell-Cooper recommends leaving the bins open at the front so that compostable material can be easily barrowed into the heap. Many variations on the three bin system will have a boarded front to retain the compost be designed to allow the boards to be removed to enable the bins to be emptied or the contents to be forked from one bin to another to aerate the contents. The size of the bins will depend on the size of the garden 8` x 8` is recommended for what is described as a big garden, 6` x 6` for a large garden of ½ acre, with 4` x 4` being adequate for a garden of a quarter acre. It is suggested that the larger bins should be 6 or 7 foot high. These sizes are included here as an item of general interest as most of us will have gardens that are considerably smaller than this. A minimum size of 3 foot square is recommended by other sources for smaller gardens or allotments as heap of less than 3` x 3` will not retain sufficient heat for a hot process to operate effectively. Many methods using a 3 bin system involve moving the compost from one bin to another as a means of aerating the material and to revitalise the microorganism causing the heap to rise in temperature. We will look at these methods later, the system recommended by Shelwell-Cooper does not involve moving the material between bins but uses alterative layers of garden waste and “activator”. An initial 6” layer of garden material is laid directly on the soil is trodden and raked level. This followed by a layer of manure applied at the rate of 3 ozs. per square yard (an easy calculation if using a 3` x 3` bin). Any manure can be used including poultry, pigeon and rabbit manure enabling the waste from vegetarian pets to be utilised, although purchasing fish, blood or seaweed manure was the most common activator when this technique was widely used. On allotments cow or horse manure which is normally readily available could be used provide it is not contaminated by weed killer. Another layer of vegetable matter is then added followed by a layer of manure the bin is full. It is important that the top of each layer is levelled so that the heap heats up evenly. A layer of soil, about 1” thick, is added to the top of the heap and/or the heap is covered by thick blankets to help retain the heat and to prevent the heap becoming waterlogged. The heap is then left for 6 months before being harvested. In the meantime the process is started again using the seconded bin. A three bin system should allow one bin to be filled, one maturing while the third is being harvested. In practise a wide range of wooden (and sometimes asbestos cement) bins and varitions in technique using one, two or three bins are actually used. A quick method of Hot Composting producing compost in 18-21 days is the Berkeley method, developed by the University of California, Berkley. This uses a heap about 1.5m high and 1m square or two or three wooden compost bins allowing the material to be turned more easily. The objective is to reach and maintain temperatures of 55-66C. Ideally there should be a C:N (greens:browns) ratio of about between 25 and 30 :1. There is no need to is no need to get to technical. You can make adjustments as you work. Materials with a very low C:N ratio (greens) decompose very quickly, because they are high in nitrogen, e.g. grass cuttings. If the material in the heap is turning into a wet black smelly mess, add more browns to raise the ratio e.g. cardboard, dry leaves, sawdust or wood chips. If on the other hand, the material is sitting dry and inactive due to the C: N ratio being too high (to many browns), you can lower it by adding manure or grass clippings. The heap should be built all in one go so you will need to collect sufficient greens and browns to make a heap 1m square and about 1.5m high before starting to build the heap. Start building by alternating layers of browns and greens. Do not make the layers too thick. Water each layer as it is added. It helps if a fresh natural activator such as comfrey, nettles, or old compost is added in the middle of compost heap as it is built to give the process a kick-start. Once the heap is built water it until the water starts to run out of the base.On the fourth day after building the heap the compost will need aerating. Turn it over, outside turned to inside, inside turned to outside. This is easier if a two or three bin system is being used. The moisture should be checked at this stage using the “sponge test” squeezing a handful of the compost, which should release just a drop or two of water. (Wear gloves). The compost heap should reach its maximum temperature by day six. Check using a thermometer inserted into the centre that it has reached 55-65 C. Turn the compost heap over every second day (on day 6, 8, 10, 12, 14, 16, and 18). The temperature should peak at 6-8 days gradually cooling down by day 18. As the heap cools, composting worms will start to inhabit the compost. The finished compost can be kept to mature. A slighly different rapid composting method is described by Prof. Robert Raabe also of Berkeley which does not include the watering of the compost heap during construction. The method is similar to that decribed above and uses equal amounts of greens and browns to provide a C:N ratio of about 30:1. However in this technique the materials have to be kept small between 0.5 and 1.5 inches in length to aid rapid decompostition. Garden plants are best pruned to this length or chopped with a sharp spade while browns casn be shredded. The bin is filled at the beginning of the process and no material is added once the process has started. The size of the bins should be about a metre square to enable sufficient heat to be generated and retained. As in the above techniques the use of two or three bins will make turning the compost to aerate it much easier. During turning material from the outside of the bin should be moved to the centre. wooden bins with removable slats on the front make turning easier. If using a home made palate it is easier to design it so the the front palate can be removed. A cover is necessary to help retain the heat. Using this method of hot composting the pile will shrink so it is importasnt that the cover rests on the compost inside the bin rather than across the top of the bin.The objective is to cover the compost not the bin. Turn the material being composted every day. If you miss a day you will slow the process. Daily turning should produce compost in two weeks. Turning alternate days will add an extra week to the process. If the compost has not heated to 60-70C within two days the mixture will need adjusting to give the right Green/Browns ratio. If the heap is to dry add water if to wet spread out to dry and then rebuild. There a numerous recipes for making compost in traditional heaps or bins using lime as an additive and I include brief details of a couple more. Layer twigs in the bottom of the heap to provide drainage and to help with air circulation. If you have a favourite recipe please send it to me.